Tom Gruber, one of the minds behind Siri, stated in his 2017 TED talk that “we have a choice in how we use AI”. In a bid to build excitement around the potential of AI, Gruber’s choice was whether or not “we use AI to automate and compete with us, or to collaborate with us.” Gruber framed his choice as a humanistic one, but there’s cold, hard, and all too often: public commercial consequences to making the wrong decisions. As far as public facing roles go, the field of community management is about as public-facing as it gets. My team is responsible for communicating with, assisting, and mobilising large groups of people in an online forum that’s viewed by thousands of people each day. Couple that with the fact that anything they write can live forever, and you’re playing a high stakes game. With the risks what they are, it might surprise you that finding ways to automate processes is actually quite high on the team’s list of priorities. We cannot do everything, and with a steadily increasing list of tasks requiring the team’s attention we’re constantly investigating different kinds of levers to shoulder the burden and automate our work. The litmus test for me is simple: will the automation tool ultimately facilitate a better experience for the people we’re serving? Cost reduction and efficiency are frequently by-products of this approach. They can even be objectives but to make them the sole aims of an automation initiative, without the test acting as a filter, is a trap. One need look no further than the ASOS’ customer service chatbot blow-up to realise the risks of putting the cart before the horse. 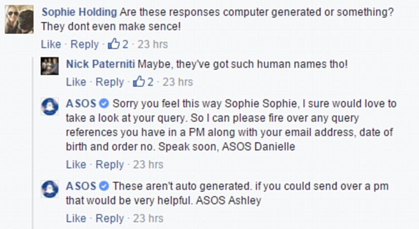 The real tragedy behind the ASOS chatbot tactic is that transparent use of the bots would have actually passed the litmus test with flying colours; the purpose of the bots clearly being to extract the requisite customer details in order to facilitate speedier responses from customer service reps. Bots are essentially doing the work of a form. Would a customer really care that this step of a process is automated? I doubt it. However, in not declaring their approach up-front, and by disguising a tool as a human, the customers feel deceived, undervalued and short-changed. Whilst the end result ultimately favours the user, the implementation of the automation tool has been made with the ASOS staff in mind rather than the customer, and for that reason it falls flat. A less acknowledged risk, although no less real is from the end users themselves. A bot is essentially a system, even if that system has learning built into it and like any system, it can be gamed. No matter how polite and docile your end users are, it’s a guaranteed rule of the internet that some sub group of your users will attempt to break your system once they figure out how it works; Microsoft’s Twitter chat-bot turning into a racist douchebag and inadvertently damaging to the company’s image being a foremost example. When it comes to the job of dealing with other humans, humans might be imperfect creatures but they will always be the best option. Life experience, connection, empathy and contextual awareness cannot be automated for long. Because of this, in my experience, the best and safest automation is that which happens behind the scenes. The type that lessens administrative burdens and facilitates the very thing we can never get enough of in public facing roles: more time to meaningfully connect. 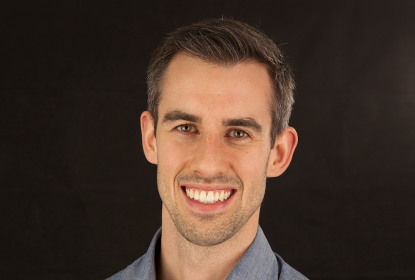 Matthew Cox, Envato Community Marketing Manager and MC at Swarm 2017, Australia’s Premier Community Management Conference taking place this Wednesday 30th August and Thursday 31st August at the University of Sydney. Automation, AI and Community Management is a key topic at Swarm this year.